Help your child celebrate a year of living life to the fullest with type 1 diabetes. 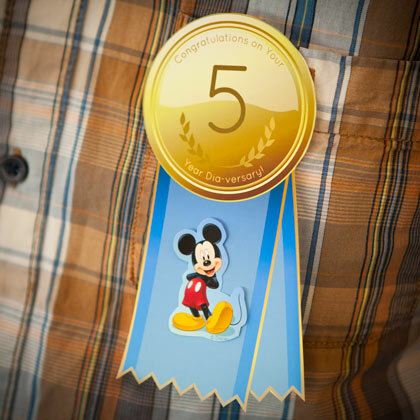 Click here to download a page of award medals for a child’s first, second, third, fourth, fifth, and tenth anniversary of diagnosis. Print them on sticker paper or regular paper, cut them out, and stick, tape or pin them to clothes, lunch boxes, or notebooks. Someday in the future, your child could be marking the day with a Lilly Diabetes Journey Award, celebrating individuals who have lived successfully with diabetes for 25, 50, and 75 years. Medals are awarded not only as a way to observe these major achievements, but also to give hope for the future to those just starting on their diabetes journey. Moms (and a doctor) share their top tips. We’re proud to feature the stories of these remarkable young adults who refuse to be defined by their disease. Coco is a young monkey who has type 1 diabetes. Print out a picture of Coco and let your child color her in! Clear up the confusion with an overview of the key differences -- and similarities. Cough syrup, chewable vitamins, gum…pet food?? Find out if you need to cover the carbs in these and other (semi) edibles.